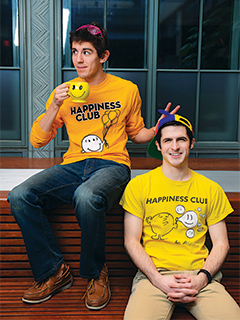 The co-chairs of Northwestern’s Happiness Club are leading the charge for joy on campus. of candy to classmates deep in study. The “superheroes” of Happiness Club have struck again. Founded in 2008 to give Northwestern a boost of joy, Happiness Club has since become a force for silliness, friendship and community on campus. Co-chairs Blake Disiere ’16 and Alex Lower ’15 talked to Weinberg magazine about the inspiration behind the club and some of their favorite activities. Why does Northwestern need a Happiness Club? AL: School can be stressful, and it’s easy to get wound up about the challenges and decisions you face. Happiness Club lets you take a minute for yourself and appreciate the little things. It also lets you pass happiness on to others by being part of our events. What does Happiness Club do? BD: Happiness Club specializes in events that make people say, “Aw, that made my day.” Our flagship event is “Free Hugs and Hot Chocolate” before exam week, right after the all-campus primal scream. Another one that’s pretty popular is “What Makes You Happy Wednesday.” We stand in a general area with whiteboards and markers and ask people what makes them happy. We take pictures of their responses and post them on our Facebook page. AL: The most common responses are “sleep” and “family,” but we get a huge range, since there are so many things that make us happy! I love to see people who just draw an arrow pointing to their friend. BD: We also work with the student government to bring therapy dogs to campus before finals. We try to come up with new events every quarter. Last quarter you gave out bubble wrap. BD: Yeah, that was my baby. It’s cathartic to pop bubble wrap. It’s just a natural stress-reliever. I think we’ll keep doing that. Do you have any memorable stories? AL: We were playing Capture the Flag on the upper floors of Tech one night — so much fun — until the campus police showed up, demanded to know what we were doing, and kicked us out. So we just headed to the lakefill and finished our game there. A club centered on happiness is very unique. Has the idea spread to other campuses? BD: Our Happiness Club was the first of its kind, but we get emails from other schools looking to start their own clubs all the time. I’ve given them advice and encouraged them to get started. That’s another fulfilling part of Happiness Club — knowing that the idea is spreading.